A cold frame is really a mini-greenhouse. 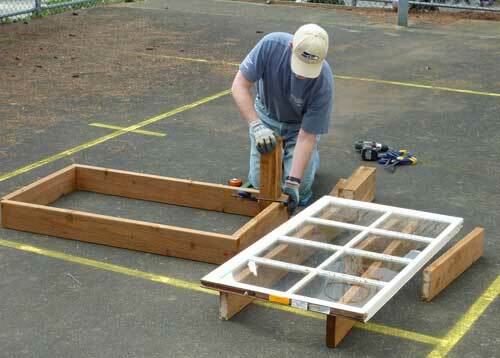 In this article I show how you can build a cold frame easily out of 2 x 6 planks. A cold frame is just a bottomless box with a hinged lid that lets in light. The lid is hinged so it can be propped open on sunny days to avoid getting too hot and closed at night to protect from cold temperatures. 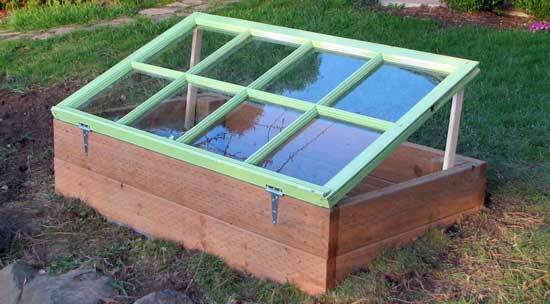 For a lid you can use a recycled window or build one out of a wood frame covered in heavy clear plastic. I wanted to build a cold frame because I needed a frost-safe place to harden off my tomato plants. I live in Seattle so warm spring weather can be elusive. I can use the cold frame for the month or so in the spring for protecting early tomatoes and then I'll repurpose it for growing fresh lettuce, spinach, and other vegetables all twelve months of the year. In this article I show how you can build a cold frame easily out of 2 x 6 pressure-treated planks and a window sash top. You'll create an environment protected from harsh wind, rain, and cold night temperatures--just what you need to get your tomatoes and other garden plants off to a strong start. Cost is always a consideration. Some of the other cold frame construction methods I investigated involved a bit too many precision angle cuts; it is a good idea to angle your window toward the equator for more sun exposure. But my design only requires straight cuts so is very simple to build. The cold frame is simply a small raised bed topped by a recycled window attached with hinges. Once warm summer weather arrives I'll remove the top until fall and the cold frame will become a 3-foot by 5-foot raised bed garden. I was happy with the raised bed construction design I had used to build a 4-foot by 8-foot version so used the same construction methods. You may benefit by reading through constructing raised bed gardens. This type of construction is pretty heavy-duty and should last for many years. The actual box dimensions are dependent on the size of your top. 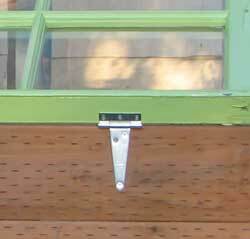 Measure the size of your recycled window sash or aluminum/glass doorframe, then build the box to those dimension's. For example, if the top is 2-feet wide and 6-feet long, that's the size you want to make the box. I bought my window at Second Use in Seattle for $10. I used 2 x 6 pressure-treated planks for the sides of the cold frame. You can use 2 x 4's, 2 x 8's, 2 x 12's or whatever you have on hand. Use whatever is most economically feasible. Pressure treated wood should be of a type that is safe, so if you want to use it confirm with your retailer. If you have recycled lumber that's perfectly okay too. The main idea is you want to build a cold frame box of sufficient precision to avoid gaps that will allow in the cold air. I used 4-inch "T" hinges (see photo) to connect the window sash to the box. I then cut two sticks and screwed them to either side to firmly support the top when it needs to be propped open to allow ventilation on warm days. I spray painted the window frame Green Apple using indoor/outdoor paint. Looks nice, don't you think? Since the corner posts may extend beyond the sides you'll need to at least dig out the corners when setting your box into position. You can either position it	on top of the ground or bury it partially in the ground. My yard is sloped, so it required digging down 8-inches on the north side to make the box level. You will get better insulation if it is set at least partly below ground level. 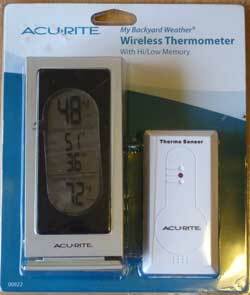 After you build a cold frame you'll want to monitor the temperature inside the box. I discovered you can buy a wireless temperature sensor at Home Depot for only $16 USD. It will record the high/low/current outdoor temperature and send the reading wirelessly to the base unit up to 100 feet away. The sales clerk said his has worked with no problems for two years so that's a good sign that it works. You ought to consider some type of thermometer to help you judge how well your cold frame is performing and when to open for ventilation. After a cool summer growing season in Seattle we were blessed with plenty of fresh, leafy lettuce. And believe me, with salad lovers in the family that is some kind of cost savings! You might want to consider getting an automatic opener arm like the one below offered at Amazon to keep your cold frame from overheating on sunny days.